San Antonio had extensive little league participation by Mexican American communities represented by the numerous Catholic Youth Organization (CYO) teams. This is a shot of the Little Flower team that was part of the Little Flower Basilica organization. Felipe Delgado, the man in his iconic hat, started his little ball club as the New Braunfels Cardinals--Later the New Braunfels West End Lions--in 1947. The team played at West End Complex built and funded by Mr. Delgado and community volunteers. This is the King Ranch Cowboys team of 1952. The team is made up of the cattleman that worked the ranch. They are famously known as the Kineños. For many of the men the game of baseball was their only break from days full of hard work. 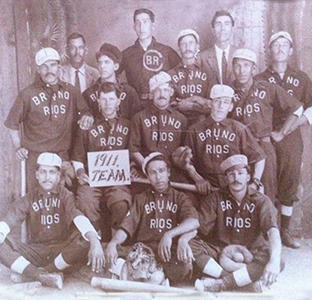 A long quiet history of the Tejano baseball leagues is starting to raise its voice. In the early 1900s, baseball in south Texas was a big deal. The Brownsville Tigers, the Mission 30-30s, the San Antonio Bears and many, many more were playing all across the region to healthy crowd sizes of well dressed fans. Some of these teams dated back to the 1800s. According to a forthcoming article in the Journal of The West by Alberto Rodriguez, a professor at Texas A&M Kingsville, the baseball leagues were about more than home runs, they were about access to education, and they represented social mobility for Mexican Americans on the border. But this popular south Texas tradition has had very little written about it, and a few people want to change that. A weighty comparison, but Garrett is the first to admit he is passionate about the topic. He has a book coming out in July, the first in a series on Tejano baseball, which is titled Mexican-American Baseball in the Alamo Region. It will look at the teams from Bexar and surrounding counties, all the way to the Coast and Corpus Christi teams. Garrett and others are hopeful that a research hub can be funded locally, and that, at some point, San Antonio could house a hall of fame for these baseball players. Garrett and others are presenting on the topic this 2-4 p.m. Sunday, at the Institute of Texan Cultures. Joe Sanchez, has a long family history with the Spanish American League Teams.